The Cornucopia Institute released a report today making the compelling case for protecting children’s health and development by choosing organic foods over their conventional, chemically grown and produced counterparts. 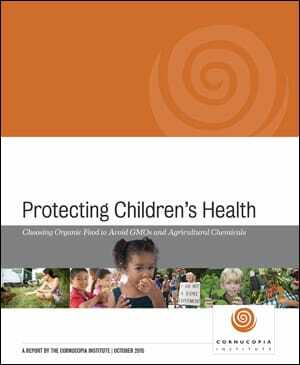 The report, Protecting Children’s Health: Choosing Organic Food to Avoid GMOs and Agricultural Chemicals, cites scientific data from numerous peer-reviewed, published studies that all point to the importance of protecting children from pesticide exposure. Replacing Mother: Imitating Human Breast Milk in the Laboratory, details research questioning the alleged benefits of adding “novel” omega-3 and omega-6 fatty acids, produced in laboratories and extracted from algae and fungus, into infant formulas. 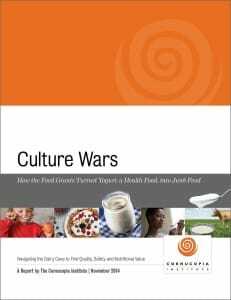 The report presents disturbing research indicating that the new additives placed in infant formula are seriously endangering the health of some formula-fed newborns and toddlers. Aggressive marketing campaigns by some infant formula manufacturers appear to have encouraged new mothers to give up nursing and switch to use of the questionable infant formula products. Organics is at a crossroads. The founding principles of organics are increasingly under attack by powerful agribusiness corporations that want a slice of the organic profit pie. Consumers who expect organic foods to be free from controversial non-organic ingredients can no longer trust the organic seal alone as an assurance that unnecessary synthetic and non-organic ingredients are kept out. Organic decision-makers have been bombarded with corporate lobbying power, and in many cases, failed to stand strong with organic farmers and organic consumers. In the fall of 2011, when asked to vote to approve Martek Biosciences’ DHA and ARA oil, derived from genetically mutated fermented algae and soil fungus, the members of the National Organic Standards Board ignored the simple fact that non-organic ingredients should be allowed in organic foods only if they are essential – as in the case of baking powder to make organic cookies, or yeast to bake organic bread. Instead, the majority of NOSB members sided with corporate interests. The Cornucopia Institute developed this guide to educate consumers about Martek’s DHA algal oil and ARA fungal oil. The guide will assist consumers in making informed decisions to buy certified organic foods without these novel, manufactured oils. What are Martek’s DHA and ARA oils? If it’s not organic, how come it’s in organic foods?